For manual stations up to 4 1/8 in. wide x 5 1/4 in. high x 1 1/2 in. deep. 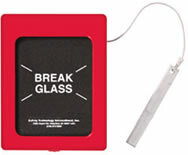 Same as STI-6100 except glass contains general BREAK GLASS message. Dimensions the same as STI 6100 Break Glass Stopper. This protective Keys Under Glass Cover allows emergency keys to be readily available in case of emergency, but not too accessible. Q: Are extra glass plates available? If purchasing, I would also need additional glass.